InkjetMall is the sister company of Cone Editions Press in East Topsham, Vermont. Cone Editions Press was first established in Port Chester, NY in 1980 as an experimental printmaking studio for etching, aquatint photogravure, serigraphy, relief print and monoprint. Today, the studios of Cone Editions Press and the offices, R&D, and ink filling department of InkjetMall occupy the same building in East Topsham, Vermont. Cone Editions Press has been at the forefront of digital printmaking since the early 1980s and inkjet printing since the early 1990s. When IRIS Graphics could not formulate suitable archival inks for its IRIS 3047 printers, Cone Editions developed its own archival inks and eventually sold them to others under the ConeTech label. Tested by Wilhelm, the ConeTech WGFA (wide gamut fine art) inks improved immediately upon the longevity of color photographs – attaining a rating higher than C-Print and Ilfachrome. The WGFA inks were originally developed by Cone Editions Press for printing Richard Avedon’s last living portfolio. The archival ink produced a very wide gamut of reds and oranges unavailable with OEM inks. In the mid 1990s, Cone Editions Press invented quadblack inkjet printing on the IRIS platform before porting it to the Epson 3000 printer. InkjetMall was eventually founded in 1998 to sell archival inks for Epson Stylus 3000 printers as well as ICC profiles (something quite new at the time). Both Cone Editions Press and InkjetMall are owned and operated by Jon and Cathy Cone. Two weeks ago, the Cones hosted Zana Briski in residence at Cone Editions Press to print using a vintage IRIS 3047 inkjet printer that was manufactured in 1987. The IRIS, now an old technology, still produces an effect that contemporary inkjet simply cannot. The IRIS produces 31 variable sized drops of ink that nuzzle, nestle, hug, adore, buddy up to, and snuggle with one another in such a way as to produce a surface quality unparalleled. 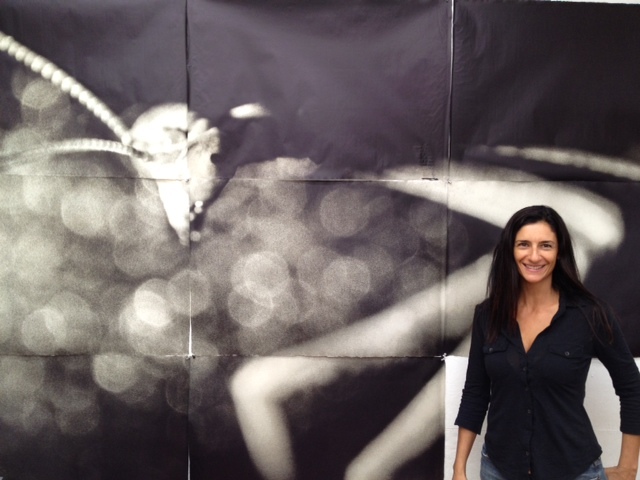 Zana Briski in front of a 9 panel IRIS print of a scanned 35mm negative of a mantis. Zana Briski is a remarkable photographer who received an Academy Award in 2005 for her powerful Born into Brothels film, part of a decade long photographic journey she produced while living within the brothels of Calcutta. The movie chronicles her experience changing the lives of children born and living in the same brothels. Recently, the last seven years of her life have been spent photographing insects – most noticeably the praying mantis. Her work takes her to some of the most remote and exotic places on Earth. Camping in the bush and in deserts she uses light at night to attract these amazing “beings”…and in solitude invites them into her “portrait studio”. We get to see bugs at a level of intimacy that we certainly could never experience on our own. As viewers we are brought to their level, rather than exist in our supreme posture a level above, or in the case of annoyed gardeners…several levels above. Zana’s insects are incredibly candid. They are bugs comfortable with their human observer. They are captured on silver film in subdued lighting produced by flash lights. Jon Cone drum scans the film on a Hell 3400. Zana and Jon make IRIS prints together working the machine 12 to 16 hours a day. The mantis portraits and those of other insect families are destined for Reverence, a migrating museum. The prints will be large. Humongous really when compared to the size of the insects. They are being currently being printed on small 25 x 37 sheets of Japanese handmade paper. They will be printed later on much larger sheets of the same gampi on the order of 5 or 6 feet high by 7 or 8 feet in length. Cone will need to formulate very special inks to accomplish the same beautiful surface using a much larger printer. Right when you open the hood you see this…. The paper is adhered directly to the drum with double sided post-it tape from behind so that it can be printed right past the deckles. Kissing the Iris for luck! The IRIS printer was invented in 1987. Cone Editions used it beginning in 1990 to produce some amazing print projects such as Richard Avedon’s last living portfolio “In Memory of the Late Mr. & Mrs Comfort” and the contemporary color prints for Gordon Park’s “Half Past Autumn“. In 1994, Cone produced what was then the largest contemporary print ever produced. A ten by thirty five foot mural printed in collaboration with Hugh O’Donnell was displayed at the DeCordova Museum as part of one of the earliest surveys on digital art. Along the way, Cone Editions printed for thousands of artists and photographers. It created the first digital print workshops based on it. It also became IRIS Graphics Marketing and Development Partner for Fine Arts in 1994 and until 1997 set up more than 50 of the first “Giclee” studios operating in the USA. Cone Editions has maintained at least one IRIS 3047 printer since Dec 1990. At one time it owned and operated four of these printers full time over two shifts and that still was not enough capacity for the awakening digital fine art market. In 1994, Cone-Laumont Editions was formed in NYC operating another three IRIS 3047 printers. And then in 1999, along came the Epson PhotoEX and the end came in sight for the IRIS. To this day, absolutely nothing prints as gorgeous and as beautifully as a full IRIS ink load on uncoated fine art and uncoated Japanese papers. True, it is very difficult to master this state of full ink load…but it is incredibly worth it. For Zana Briski – there just simply is nothing like the sheen and depth of IRIS black & white prints. Cone Editions is now developing new dye inks of immense density in anticipation of producing her large scale prints with its Roland large format printer. If history holds true, InkjetMall will be offering a very intense, very strong, fine art dye ink set soon for Epson printers. But first, like all our ink products…it will first be perfected at Cone Editions Press.